Well established with a good track record, US Search is a reliable, if somewhat stodgy, middle of the road site. 1 Who is US Search? 3 How to Use US Search? 4 How Good is US Search Data? 5 How do I Cancel US Search? Bellevue, Washington-based US Search was one of the first companies to provide information about people online and still occupies the comfortable niche it first carved out in 1994. From the beginning, US Search has been a reliable way to locate long, lost childhood friends or to verify your new neighbor’s backstory about having just relocated after living on a pineapple plantation in Hawaii for the last decade. From the start, this has been a company that seems to make certain that the information it does provide is both accurate and the most current available. 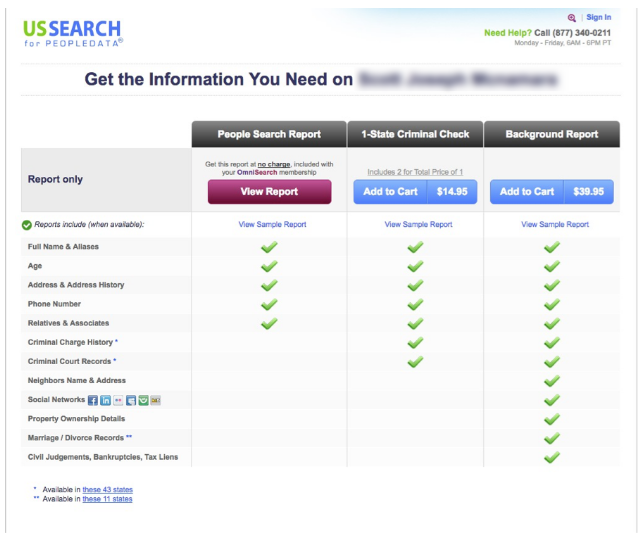 You can get some peace of mind about that new neighbor or old flame for the modest a la carte price of $2.45 for the basic one-off “People Search” report that provides full name and any aliases, age, address and address history, publicly listed phone numbers plus relatives and associates. 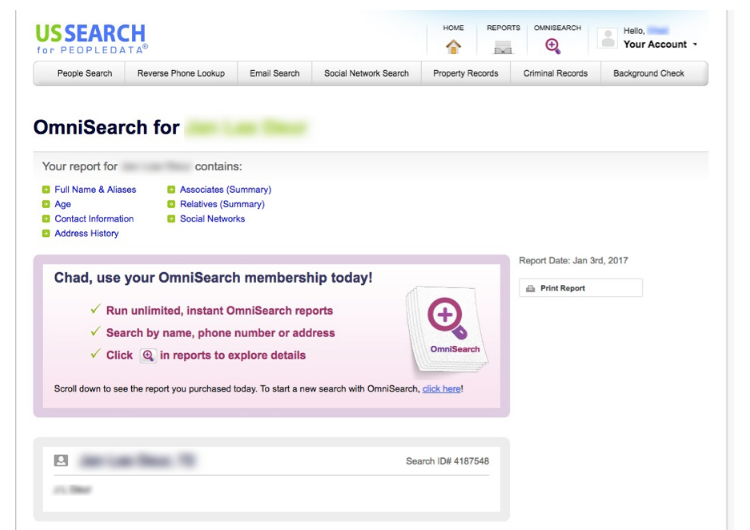 For a monthly fee of just under $20, you can perform an unlimited number of basic searches (minus relatives, but with social network info) with the company’s “OmniSearch” subscription. More detailed info, like that provided by the company’s top of the line “Background Check” comes at nearly $40 but adds real meat to the report including criminal records, social network information and financial information such bankruptcies and tax liens. In between is the 1-State Criminal Records search for around $15. Maybe not as cutting edge as it was when it pioneered the concept of supplying people’s info online, US Search remains a solid entry in the field, well-suited for those with an occasional need to search out basic contact information in order to reconnect with someone you’ve lost touch with over the years or double check a new acquaintance’s backstory. Although the signup process is fairly straightforward, it wasn’t immediately clear I was signing up for the monthly OmniSearch subscription and that if I wanted to dig deeper into any subject’s info I was going to have to pay quite a bit more to do it. This is where US Search really earns its keep. 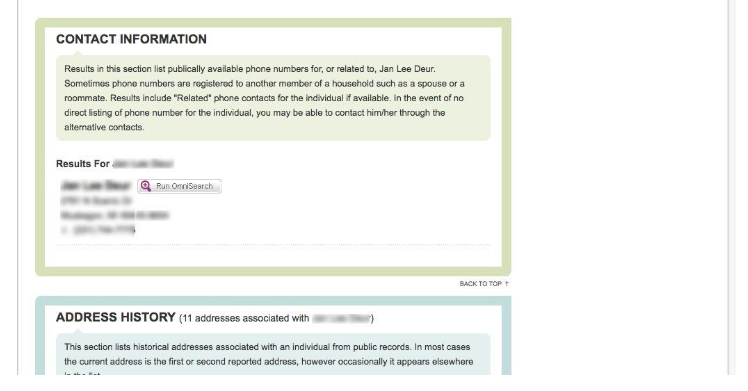 If you’re only occasionally in need of locating a shoestring relative’s phone number or feel moved to contact your best bud from PS 23, a one-time People Search is the way to go. For less than $3 you’ll get an extensive list of possible matches, allowing you to focus your efforts on the most likely subject without paying for multiple look-ups. Both include an address history check and list of relatives/associates which can be a real help in helping narrow down where you need to look or help you connect with that hard to locate someone through a third party. An OmniSearch monthly membership gives you access to the same basic info for an unlimited number of searches with the flexibility to opt-out whenever you please, an arrangement perfect for putting together contact lists for a class reunion or similar events. Be aware, thought, that you’ll be charged automatically each month unless you cancel your subscription online or, more problematically, by phone. US Search’s customer service phone lines are open Monday through Friday only from 6 a.m. to 6 p.m. Pacific Time (3 hours behind the east coast and some 7 ahead of Alaska and Hawaii. US Search’s pricier options provide more info, but, in many cases, from fewer sources. For instance, the company has access to marriage and divorce records from only 11 states and criminal records from 43 (excluding Colorado, Delaware, Maine, Massachusetts, North and South Dakota, Vermont and Wyoming). So, if you want to check if that great new dude/dudette you just met at the Flax Festival is, in fact, a serial polygamist/bigamist chances are you’ll need to go another route. Likewise if you’d feel better about your second cousin’s nephew from Wyoming with the odd face tattoo dating your daughter after a criminal records check. The 1-State Criminal Check is a check of the records available from a selected state for specific person. If that person has a criminal record in another state it will not appear in the 1-State Criminal Check. The full on, full-priced Background Check proves all available criminal and financial info in the form of property ownership details and info about civil judgments, bankruptcies and tax liens. In order to limit identify theft, US Search does not provide credit histories, dates of birth and other sensitive information. 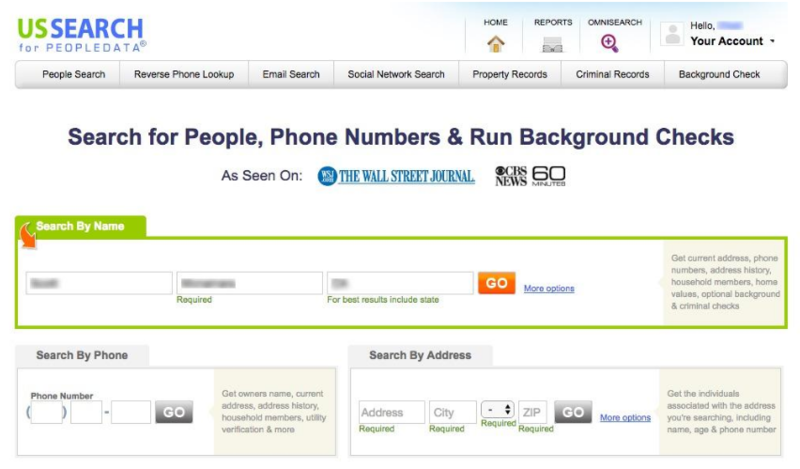 US search can also tell you who belongs to that phone number that keeps mysteriously appearing on your caller id, a family member’s phone or on a phone bill. How Good is US Search Data? As a testament to US Search’s accuracy, it remembered more about me than I did, digging up an address from two decades ago I lived at for about a year and a half. Even better when I did a little digging on a neighbor, not only did it corroborate facts I was already certain of, it filled in a few blanks besides and as an added bonus displayed a satellite photo of what I couldn’t see clearly over the fence from next door. And when curiosity got the better of me it located the current location of my first crush. Try as I might, I could not unearth any criminals or deadbeats in my circle of friends and acquaintances, confirming I must be running in the right circles. How do I Cancel US Search? Pretty standard stuff here. To cancel, go to your account settings, scroll to “membership info” and choose “cancel service.” Or you can contact customer support by phone M-F from 6 a.m. to 6 p.m. PACIFIC TIME, or Email: cservice@ussearch.com. Service terminates at end of current billing term. I’d say this is a perfect site for the occasional, largely benign searches or to follow up on strong evidence that someone is not who or what they are pretending to be. US Search could be problematic if you’re planning on using it frequently for your business or for more specific checks of employment or education histories.